We the Indigenous people of Biafra (IPOB) are writing this piece to express our concerns about the increasing evidence of kidnapping, use of torture, illegal arrests and execution by the Nigeria Armed forces towards Biafrans. It's no longer news that President Buhari's adminstration is keen in completing the failed annihilation project of 1967. An outlined mission anticipated into driving Biafrans towards extinction with 4000 Biafrans already killed and about 1000 Biafrans still held unlawfully in secret detentions, while many others are still missing. All these events has occurred since president Buhari assumed power in just less than two (2) years in office. Amnesty International has repeatedly documented and condemned widespread violations by the Nigerian government Armed forces and officials including disappearances, use of torture, arbitrary detentions, and deaths in custody under torture. Now, in the face of evidence of human rights abuses by the led Muhammadu Buhari's administration, Human Rights Watch needs to call the attention of other global community to condemn such practices by the Nigerian government under the dictatorship of General Muhammadu Buhari and also to work to prevent such unlawful practices currently been carried out by the Nigeria Armed Forces. Amnesty International already condemned all attacks on Biafrans utterly and unreservedly, and calls for their immediate cessation but it all seems to fall on deaf ears as president Buhari continues his proposed plan to keep terrorising, arresting, abducting and killing Biafrans. 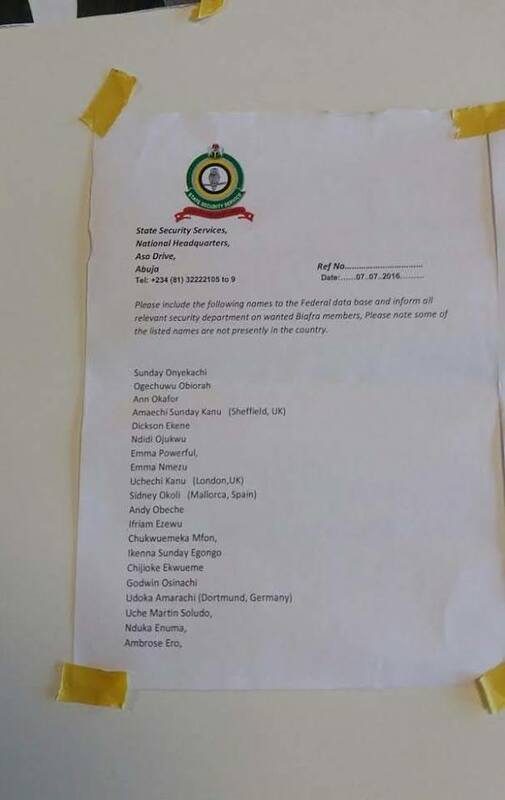 Below is a list of Biafran names about to be kidnapped or possibly killed by the federal government of Nigeria as listen by DSS. 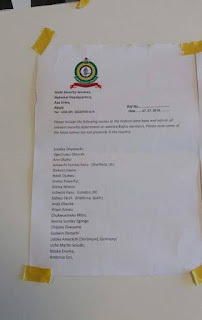 IPOB stumbled upon this list of names written by the Nigeria State Security Services (SSS), who are planning to carry out a secret operation to silently abduct and assassinate them. The Indigenous people of Biafra (IPOB) hereby call on Human right, Amnesty International, global community and also alert world leaders to kindly take note because these concerns must be addressed and not ignored in other to safeguard the lives of those written on this list. In my opinion, world leaders and the international community have not done enough to help Biafrans. We the Indigenous people of Biafra have written countless times to international communities and to world leaders yet nothing has been done to prevent the imprisonment, abduction and execution of Biafrans by the federal government of Nigeria under the monocracy of President Muhammadu Buhari. This time we the Indigenous people of Biafra (IPOB) humbly ask that this information shouldn't be taken for granted by the general public and global community. Biafran lives are at stake and those on this list needs to be protected else more innocent blood would be spilled by President Buhari. Let us please take action now to end the violence against the Indigenous people of Biafra, Self determination is a universal law which Nigeria government is signatory to. What an insult and arrogance from this foolish DSS. Are these people aware that we are in a democratic country? The global community must caution Buhari and his murderous DSS, Army, Police, Fulani herdsmen and Boko haram terrorists before his ego and tyrant mindset destroys Nigeria, which is already a failed and depressive state. Westliche Regierungen, wacht endlich auf und stoppt diese Verbrecher in Nigeria!! Keine Geschäfte mit diesem Mörder BUHARI!! Gebt BIAFRA endlich die Unabhängigkeit, damit (auch in der Welt) endlich Frieden einkehrt. Es kann und darf nicht sein, daß unschuldige Menschen jeden Tag umgebracht werden, nur weil sie um ihr Recht kämpfen und unbewaffnet demonstrieren. 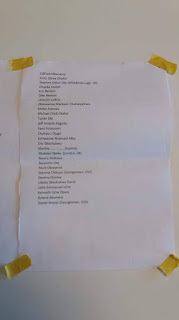 Diese Mörderbande in Nigeria muß vor das Tribunal in Den Haag. Gott segne BIAFRA! !